After my photographic distractions (which I very much enjoy, and I hope you like them, too), I’m continuing with my Croatian posts. Brudet is a fish stew of humble origins. Fishermen used to prepare it to use up left over catch that they didn’t manage to sell. So whatever didn’t go at the market, ended up in the pot. One of my favourite brudets is my mum’s dark and rich, unctuous sauce you can see above. It’s made with cuttlefish, and served with warm polenta. 1. Fry the onions for a little in some vegetable or olive oil. Add grated carrots. Fry the carrot and onion mixture, stirring occasionally, until it becomes soft, and the onions become slightly browned. Be patient, as this can take a while. Please don’t be tempted to do this quickly, this is important, and it will form the base of the stew, in which the onion acts as a thickening agent. 2. Now add the cuttlefish, and stir. Cook, stirring occasionally, until the cuttlefish is cooked, and the onions start melting into the sauce. Add water if it starts sticking. 3. Add the garlic and the herbs, some salt and pepper, and keep stirring. 4. When the onion is softened, and starts disintegrating into the sauce (or a little before that if you’re in a hurry), add a little more water,and when the water evaporates, and some more to form a thick sauce. The herb and the garlic will still taste a little raw. Continue cooking until the flavours deepen and mellow together. The cuttlefish will become soft, too. 5. Towards the end of cooking, add the white wine and the bay leaf, adjust the seasoning, and cook for another 5 – 10 minutes. Serve warm with polenta. Also good with crusty bread! My dad likes a drizzle of olive oil over his brudet. Give it a go if you fancy it. Note: Squid also works in this recipe. ps. Also try some warm polenta with yoghurt! I love it! 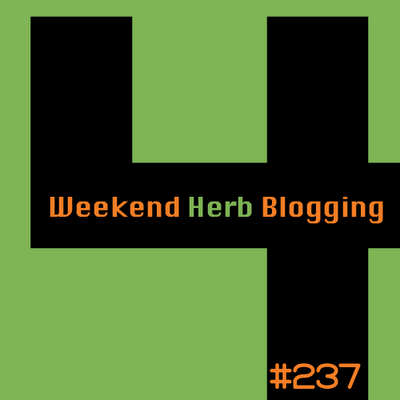 I’m submitting this to this week’s Weekend Herb Blogging event, hosted by Anna of Anna’s Cool Finds. This event, originally started by Kalyn of Kalyn’s Kitchen, is organised by Haalo of Cook Almost Anything. Reminder: Birthday giveaway open until 19 May! Do join in! This shouldn’t be soup-making time, but unfortunately it is, so let me share with you what has become my favourite way of making soup. The basic method comes from the 1977 edition of ‘Mousewood Cookbook’ via Slashfood, and I blogged about it before with my carrot and rose harissa soup. While the vegetables are cooking, you make a kind of tarka of caramelised onions, nuts and freshly grounded and roasted spices. Then you combine the two and blend to esired thickness. The possibilities are many! Pumpkin works well here, too. You can even use this method to make and flavour vegetable purees. In this recipe, the nuts give the soup some body, the onions provide an earthy base, while the spices bring it into life. The result is a warming carrot soup fragrant with roasted cumin and coriander, with a hint of heat from the chillies. I love it! This picture of spices from St George’s market in Breakfast always cheers me up. I. Cover the carrots with water and stock and boil until tender. II. Heat a pan over medium heat and add cumin, coriander seeds and chillies. Roast until lightly toasted and fragrant (about 1 min), and then put into a pestle & mortar/spice grinder and let cool. Grind into powder and set aside. III. Heat the olive oil and butter in a pan, then add the onion and cook until the onion starts going golden. Add chopped garlic and nuts and sauté until the onions are caramelised. Then, add roasted spices, stir and cook for a minute or two to give time to the spices to release their flavours. IV. Return the vegetable puree to the pan, and check for salt. Season with salt and pepper to taste. Add water to achieve desired consistency. Ladle into bowls or mugs ,and if you wish, sprinkle some cheese on top. Add another pinch of freshly ground black pepper and serve. Enjoy! I’ve created this dish especially for a blogging event run by a one of my favourite bloggers, Lisa from Lisa’s Kitchen. The event is No Croutons Required, and the this month’s topic is chickpeas. I really wanted to take part, partly because I haven’t in ages, and partly because I really love chickpeas myself. After a bit of thought, I decided to adapt one of my favourite veggie Sri Lankan recipe, varar, adding caramelised shallots, coriander and lemon juice. The result is a gorgeous warm salad of chickpeas flavoured with caramelised shallots, curry leaves, coconut and lemon juice that goes great with many Indian and Sri Lankan dishes, and it’s also delicious on its own as a snack. I love it. I hope Lisa will like it, too. A note on chickpeas. I really notice a difference in flavour between tinned and dried chickpeas, and for me, this is one instance when it’s worth taking the time to soak and cook the chickpeas. They’re so much nicer like that! I can even eat them as popcorns after they’ve just been cooked – they really are delicious. But if you really really can’t be bothered, then next time you’re in your favourite Asian supermarket, pick up a tin of East End brand of chickpeas. They’re the tastiest ones I’ve found. Still, for hummus and falafel, I’d soak and cook my own chickpeas. Heat the oil in a wok (or frying pan) and add the shallots and the chili. When the shallots start going brown, throw in the curry leaves and a little salt. Stir and cook until the shallots are completely caramelised. Then, remove half of the mixture and set aside. (This will be sprinkled on top when the dish is done). Return the pan to the heat, and add the tempering spices and turmeric. Stir. Add the chickpeas to the pan, and a couple of tbs of water (or chickpeas soaking water), and warm the chickpeas through. Then in goes the coconut and a pinch of salt. Stir it and cook for 30 s, again until it’s warmed through. Just before serving, add lemon or lime juice, chopped coriander and some more salt if needed. Sprinkle with the remaining shallots and serve. Enjoy! My version of Catalan chick peas with tomatoes and almonds (V) – This is a must-try, with its delicious flavours of saffron, garlic, tomatoes, almonds and coriander! Chana masala from scratch (V) – No shop bought spice mixes! I’m also submitting this post to to MLLA-21 hosted by Mirch Masala, and started by Susan, The Well Seasoned Cook. Our next stop on the fragrant Sri Lankan curry leaf trail: Jasmine’s Sri Lankan Fish Curry. Hot, sweet, sour – this curry has one of my favourite taste combinations. The tomato base is mellowed by adding just the right amount of coconut milk, the one that creates a balance of flavour, rather than overpowering the dish with the taste of coconut. (As much as I love coconut, Jasmine’s technique of using coconut as a supporting flavour was a revelation, and gave a new dimension to my coconut appreciation!) As ever, a fragrance of curry leaves envelopes the dish (and your kitchen), which I love. Delicious and very quick to make, this is another of Jasmine’s recipes, and it’s another winner. You know now why I fell in love with Sri Lankan food! The photo below was also taken by my friend A, while I was cooking. 1. Fry the onion together with curry leaves and a pinch of salt, just enough to soften it. 2. Add garlic, fenugreek and tomato paste, and cook for a few minutes until the smell of the tomato paste has mellowed, and lost its raw taste. 3. Add the chilli powder to the tomato mixture, and cook through for a few minutes. 5. Add the salmon pieces and cook on medium low or low heat until they’re cooked through. It’s best to go slowly here, taking care not to overcook the fish. Add the pandan leaf if you have some (which I usually don’t), and adjust the salt to taste. This day used to be widely celebrated in Croatia, in the days of communism, so yes, probably all over the former Yugoslavia. The 8 of March. Everybody knew the date, everybody knew what it was. I remember there being shows put on for mums in my primary school, and I remember shopping for presents for my mum and gifting her. One year when I was 7, I had to dress as a peacock and perform in my primary school, in front of all the mums, teachers and other kids. The costume painstakingly sown together by my mum, of course. The fact that the day was widely celebrated doesn’t, unfortunately, mean there is no discrimination of women in my home country. Croatia is still in large parts a patriarchal society, it pains me to say. Now that we’re a Catholic country, we no longer celebrate the 8th of March. There’s Mother’s Day (in May? ), but Women’s Day is not celebrated in the same way. I remember a particular scene from Ugo Betti’s poignant play ‘Il delitto all’isola delle capre’ (‘The Crime on the Goats’ Island’) where a daughter tells her mother how perfect she thought she was, how strong, standing there proud and tall, with the sun rays in her hair. (It sounds much better in Italian, I promise, though I can’t remember the exact quote now.) And the mother responds by asking whether she ever wondered how she really felt, what she really thought, standing there, proud and tall, with the sun rays in her hair. Mothers are women, too, no? People. Humans. Not defined by this one thing only. So happy Women’s Day! And if you’re a woman, don’t let anyone anywhere ever tell you that you are inferior to a man because you’re a woman. While photographing these brownies, I discovered that my under cupboard lights are perfect for food photography, soft and warm. It was like having a mini-studio! These were also the first food photos I shot in the fully manual mode, so a little milestone for me! Previously, I used aperture priority control, but this is much better! That’s my red splash back that you can see in the background in the photo below. And what were they like? Perfect! Fudgy and crumbly, with a haunting nutty sesame flavour. The recipe calls for orange juice, and I used the juice of blood oranges, which have an ever-so slightly bitter, berry like flavour, less acidic than regular oranges. It worked a treat, and the end result had a fairly complex, bewitching flavour and gorgeously soft and fudgy texture. And did you know they are vegan?! Preheat your oven to 180 C, cut the baking parchment to fit your tin. I used a round, 25 cm tin. Break the chocolate into small, even pieces and put it in a large pyrex bow. Melt the chocolate in the microwave, or over a bowl of hot water. Either way, use low heat. Mix in the tahini and orange juice, add the icing sugar, and combine thoroughly. Sift in the flour and baking powder over the mixture and fold thoroughly. Line your baking tin with parchment, and pour the batter, spreading it as evenly as possible with a spatula. Bake the brownies for 20 min. Serve warm or cold, and enjoy! NOTES: They are gorgeous! Possibly even better than my previous Spedilicious Brownies! Next time, I’ll use less sugar, as 150 g was a bit too sweet for me. Also, I’ll try using different nut butters. Almond springs to mind! Hey, we can even try using white chocolate instead! How about white chocolate, almond butter and lemon juice (diluted with water), with pistachios? The creative possibilities are endless! I know there’s not much difference between the these two photos, but I just couldn’t decide which one I prefer. What you think?